Even when patently not at their best, the Tokyo String Quartet is a pleasure and a privilege to hear live. Their performance in the acoustically pristine Kiggins Hall at the Emma Willard School in Troy was involving and energizing. 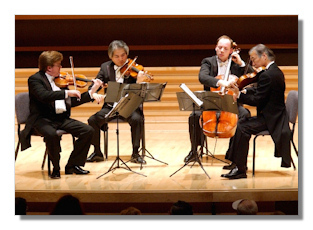 Beethoven's simultaneously most wide-ranging and most disjunct string quartet provided the evening's theme more aptly than the Tokyo players might have wished, as amongst the considerable graces of their performance were numerous unintended disjunctions and lapses, while the group's members often seemed estranged, barely glancing at each other as they played. I had the uneasy, intermittently recurring feeling that the players, who share a musical intimacy not unlike the more prosaic intimacies of long-married couples, were not only suffering from more than a few major unresolved disagreements as to how best to approach certain cruxes in the music, but, in the Mozart especially, were playing as though half asleep: ticked off and drowsy, a most disconcerting combination. Still, if anyone can play Mozart's bottomless G Major string quartet exquisitely whilst half asleep, it's these gentlemen. Make no mistake: their playing was often electrifying, and there were more than a few moments of such profundity, clarity, and grace as to leave one in no doubt as to what this band is capable of at its best. But perhaps now you see what I mean by saying the evening's prevailing theme was one of disjuncture, not only in terms of the musical selections and the manner in which they were performed, but in the progress of my own perceptions as well. It's not simply that my sense of what I witnessed moment by moment evolved and changed even as the concert unfolded, but those changes continually altered and expanded my understanding of what I had already seen and heard, music heard now altering music heard seconds or minutes or hours ago – a process of reception, recollection, reassessment, and reinterpretation that continued, intensively, throughout the four days immediately following the concert, as I pondered the experience and wrote a first draft attempting to describe it. Though the concert's overarching theme was clear to me from early on, before Beethoven's quartet had even begun to sound, in other respects the interpretive place I arrived at was quite different from where I began, and the course of this review reflects that evolution. The opening paragraph, above, like the recital's opening minutes, was for me a point of departure in an on-going journey, a place or stance I left behind even as it led me to new places I might never have otherwise come upon, new stances I might never have otherwise taken, rejection leading to a new kind of acceptance. And there it is again: disjuncture, displacement. The center, in order to hold, cannot hold. Beethoven understood this. Though I am intimately familiar with the Mozart and Beethoven quartets and own numerous recordings of both, this was the first time I'd heard either work live. I heard a recording of the Szymanowski once or thrice more than a decade ago, but for all the impression it made on me I may as well have never heard it at all. This provided another disjuncture, for hearing a live performance of a work one knows backwards and forwards is a wholly different experience from hearing a work essentially for the first time, its character and contours unfamiliar; having both kinds of listening experiences in one concert is ideal. As for the Tokyo String Quartet, I have been only the mildest fan of their work. Their first Beethoven cycle, recorded twenty years ago and long considered one of the best available, left me unmoved: though beautifully even flawlessly played, I found it too heavy on the vibrato and suffering from a pronounced lack of expressive depth in the slow movements. On the other hand, the two TSQ recordings I have long treasured are a disc pairing Mozart's central string quintets, K. 515 and 516 (with Pinchas Zukerman on second viola), and a disc of quartets by Takemitsu, Barber, and Britten. But all those recordings were made by the third and best known of the Tokyo Quartet's seven lineups (in 42 years! ); before Sunday night, I had not heard a note by the group's current configuration (stable since 2002), which features relative newcomers Martin Beaver on first violin and Clive Greensmith on cello, long-time member Kikuei Ikeda on second violin, and founding member Kazuhide Isomura on viola. One thing I noticed right away about the current lineup was a greater restraint in their use of vibrato, and a wider range of string textures than anything I recall hearing on record. It may be that I did the Tokyo Quartet a disservice by way of my pre-concert preparations. As it had been a month since I'd listened to the Mozart quartet, and well over a year since I'd heard the Beethoven, a few hours before the concert I sat down and listened to superb recordings of both: Quatuor Mosaïques' classic performance of K. 387 (my favorite of the near-dozen recorded performances I know: no one captures the sheer exuberance and joy of the finale better, nor the aura of mystery pervading the Andante cantabile, nor the voice-of-God vastness of the earth and sky that lies somehow latent in the trio of the minuet); and my first hearing of the Alexander String Quartet's new recording of Op. 130, from their recently-completed second Beethoven cycle (a cycle that is shaping up, the more I hear of it, to be one of the three greatest Beethoven quartet cycles of the last quarter century, if not longer – the other two being those by the Prazák and Endellion Quartets). As I listened, I took notes as to the musical cruxes in the Mozart and Beethoven to pay particular attention to in the Tokyo's performance. But the near-perfection of the Mosaïques and Alexander performances interpretively and technically (both are studio recordings) cast perhaps too harsh a light on the inevitable exigencies and imperfections of any live performance; really, comparing one quartet's studio recording with another's live performance is less than fair: the differences between the two kinds of event are legion, no matter who the respective groups are. Better in any event to give a live performance as much room to tell in one's sensorium and memory as one can. In light of that, in the days after the concert I deliberately avoided listening to music as much as possible: even ninety-six hours after the concert's end, with a first draft of this review finally completed, the last music I had listened to with concentrated attention was the music performed live in Kiggins Hall the previous Sunday afternoon, part of the long running and justly celebrated Friends of Chamber Music concert series. There they were, the world-famous Tokyo String Quartet, walking out onto the stage, acknowledging the audience's warm welcome with some shyness (as if slightly embarrassed), taking their seats, settling down, settling their instruments into place, raising their bows, and, with an all but invisible signal and an easy unity of attack, commencing to play the opening Allegro vivace assai of Mozart's fabulous G Major string quartet, all without once so much as glancing at one another. It was uncanny. Martin Beaver was seated with his back half turned to Kikuei Ikeda. The playing was more than fine, to be sure – but not much more. Frankly, during the recital's opening minutes the players seemed uninterested in what they were playing, uninvolved. Not that Mozart was much help, not at first – the opening movements of his mature works are often less accessible, less appealing, perhaps ever-so-slightly less inspired, than those that follow, as though the complexities of sonata form, and the long shadow Haydn's own mastery of that form (he practically invented it!) cast over everything the adult Mozart did, took up too much of his care and confidence. Contrary to the popular image of Mozart tossing off one brilliant composition after another with nary a second thought, we know that he labored long and hard on this quartet, as he later would on the others that came to make up his Six Quartets Dedicated to Joseph Haydn, Op. 10. The G Major quartet (composed during the waning months of 1782, when Wolfgang was 26) is the first of that august set, and rightly so. In its later movements Mozart's quartet blossoms into something very nearly unsurpassed in his own output, an eloquent darkness shot through with the profoundest light, and it was lovely to hear how Mozart worked his magic on the Tokyo players from beyond the grave: soon much of their seeming indifference melted away, their infrequent eye contact with one another and with the sheet music arrayed on the stands before them became less a sign of estrangement and more a sign of musical comfort and intimacy, and their playing grew noticeably warmer. Still, they never quite twigged to the latent profundity of the Menuetto's trio (most groups don't), however lovely both nevertheless were in the Tokyo's hands, full of sparkle and interest. And the Andante cantabile! So mysterious, Mozart searching out "the bottom of God's secrets" (the phrase is Tyndale's), and yet so luminously beautiful from beginning to end; the Tokyo played it magnificently, save one astonishing, highly instructive mishap that came near the movement's end: at a sudden musical flourish with accompanying brief burst of speed, the group's ensemble simply came apart, as if one of the players had skipped ahead of his brethren, throwing both himself and his colleagues off. (It happened so fast and was so unexpected that I could not discern the precise cause.) For a long, mind-altering moment (though really it lasted no more than a few seconds), there was musical clash and chaos. But even more astonishing was the alacrity with which they recovered: you could almost hear the rushing sound of the music falling back together again, meshing once more into a pristine unity of purpose and attack. The mistake showed these masters to be human; the recovery showed these humans to be masters. I couldn't imagine a swifter, more unfussy recovery; and they played on as if nothing untoward had happened. I think I fell in love with them a little at that moment. Mozart's Molto allegro Finale is without question one of his finest moments as a composer. To honor his beloved friend Papa Haydn, who had concluded three of the six quartets in his epoch-making Op. 20 set of 1772 with fugues of increasing complexity, Mozart crafted a truly ingenious fugue, greater than any by Haydn, and then intricately interwove it with the most ebullient sonata-form homophony, overflowing with grateful melodies worthy of the greatest in opera buffa: the result, for me, defines musical joy. (In 1784, when Mozart played this and his next two quartets privately for the first time, his pick-up group consisted of the four most famous composers then alive: Karl Ditters von Dittersdorf on first violin, Joseph Haydn on second violin, Mozart on viola, and Johann Baptist Vanhal on cello; for a few hours that day, the flies on the walls were kings.) This combination of old-style polyphony and new-style chordally-accompanied melody brought the Classical Style to the fullest flowering it had yet enjoyed, opening it up to entirely new possibilities, possibilities it would take a Beethoven to fully exploit. I cannot hear Mozart's Finale without wanting to leap up, throw my arms wide, and dance, though the only place big enough to properly contain it is all outdoors. The Tokyo Quartet played it quite splendidly; at several points I nearly leapt out of my chair, but managed to restrain myself. Yet, as fine as their performance was, I knew they had done better, and would again. More importantly, they knew it too. One thing that troubled me throughout the recital was the relative lack of prominence, in the group's ensemble blend, of Kazuhide Isomura's viola. The standard seating arrangement for modern string quartet performances already puts the violist, seated at stage left in the semicircle of players, at a disadvantage, as from that position the viola is the only one of the four instruments whose f-holes are facing away from the audience, which makes it harder for the player to project the sound. I haven't found this to be particularly troubling at other quartet recitals, but in the Tokyo's performance Isomura consistently failed to project his viola lines to a degree comparable to that of his fellow players, such that his lines were often swallowed up by theirs. I positively love the texture of the viola's sound, and its location at the center of a quartet's musical range is critical to the fullness of the musical argument. Haydn, Mozart, and Beethoven all preferred taking the viola parts when reading quartets and quintets (the last day Haydn and Mozart ever spent together, in December 1790, they gleefully took the two viola parts in a read-through of Mozart's just-completed String Quintet in D Major, K. 593; Haydn, who quit Vienna for London soon after, said later that he knew, when they parted, that he would never see Mozart again). My concern, which grew over the course of the concert to an outright worry, was that the venerable founding member Isomura had become the quartet's weak link. Yet I am constantly struck by how one's impressions of a connected series of events can change in retrospect. I now recall with pleasure the beauty of Isomura's playing of the prominent viola lines in Beethoven's Andante con moto ma non troppo. At the time I was flooded with relief and began to think that my diagnosis was wrong, that indeed I was simply unhappy with Isomura's willingness to remain perhaps a little too humbly in the background, a choice and position not without a long-standing tradition. The more I reflect on this the more I suspect that, far from being the quartet's weak link, Isomura remains their truest foundation; as I recall his calm demeanor, his poise, the undemonstrative purity of his playing, it seems more and more to me that there was something profound about Isomura, an inner stillness, almost as if he embodied the essence of the directorial style of the late great Japanese filmmaker Yasujiro Ozu, with his unmoving camera invariably placed just below head height of an adult man sitting cross-legged on the rugs or mats of home, gaze canted up ever so slightly, drinking in everything around and above with calm serenity. However much I still wish those viola lines were louder, less prone to be lost amidst his colleagues' violin and cello lines, I find myself grateful for Isomura's steady, faithful practice of his art. The stylistic, historical, cultural, and temporal disjunctions between Mozart's Fourteenth Quartet and Szymanowski's First (written in 1917) are so deep that one can only be grateful for the concert ritual of having the performers, finished with one work, take their bows and exit the stage before returning after a brief palette-cleansing interval to play the next. We needed it! Looking around at the expectant faces of my fellow concertgoers, it was abundantly clear to me that almost no one in the audience had any familiarity with the next quartet, or its creator. Karol Szymanowski (1882-1937) was a Polish pianist, composer, poet, and novelist; his musical output includes four symphonies, two violin concertos, two operas, a handful of works for piano, and two string quartets, works only infrequently performed and recorded. I learned during a brief conversation afterwards with cellist Clive Greensmith that the Szymanowski First is brand new to the group, and that based on it they look forward to trying out the Second Quartet as well. At twenty minutes significantly shorter than its program mates, the First Quartet's outer movements are full of highly angular, fast, melodically acerbic, dissonantly heterophonic, rhythmically blunt music, with frequent recourse to tight unison passages. One figure repeated in both movements involved a series of short bowed phrases ending in emphatically plucked chords. The effect was quite arresting; if memory serves, in the latter movement these figures are developed into more elaborate pizzicato passages. The slow middle movement is full of darkly austere beauties; there is telling use of ethereal glissandi and incredibly pure overtones. Without my knowing the work, it was nevertheless clear to me that the Tokyo players were giving it their best; their ensemble was never tighter. The music intrigued me enough that I plan to get to know both of Szymanowski's quartets (though it was clear from comments overheard during the intermission that most of the audience felt rather differently). Like Mozart and Beethoven, Szymanowski understood that we are all concatenates of light and dark, each one of us uniquely so. Beethoven's late B Flat Major string quartet is full of deliberate disjunctures, compound self-interruptions, contrary rhythms and whole musical worlds that never quite mesh, yet somehow do, almost miraculously forming a sequence of musical dovetail joints that require the utmost precision to execute successfully – something the Tokyo, again and again, failed to do. Rather than fully articulating the evolving dynamics of contention, the whispered clashes of contrary rhythms and modalities, the paradoxically disjunct junctures – qualities featured, to greater or lesser extents, in every single movement, however uniquely deployed in each – and this in a work whose individual movements themselves form almost violent contrasts to one another – the Tokyo Quartet tended to either smooth them away or let the structural seams come unglued, even as, more often than not, they beautifully executed the (by turns serial, irruptive, intertwined) sections being thereby (dis)joined. The group was at their best in the fifth movement Cavatina, an aria from a ghost opera. There were no disagreements here, or if there were they were carefully hidden away. Martin Beaver played most ethereally and beautifully, almost transforming his violin into a human voice, singing, with quiet humility and love, of loss and transience, of yearning and acceptance, of one searching the farthest reaches in what's closest to hand; his compatriots accompanied him with exquisite warmth and delicacy, and when the music shifted into another register, one plainer and simpler yet even more radiant, a soul's resolve, performers and audience somehow melted away, leaving only the music, a brief lovely echo of something undying. And thence after a long journey through a digressive labyrinth (what other kind is there?) we finally arrived at the Allegro Finale, Beethoven's substitute for the thorny austerities of the Grosse Fuge. It may be tempting on first hearing to dismiss this replacement movement as a fluffy counterweight to the quartet's true finale; but what the Tokyo Quartet proved to me on Sunday is that there is nothing remotely slight about this music, and it need make no apologies to the Great Fugue. (Noted Bruckner scholar William Carragan, who I ran into immediately after the concert, told me the alternate Finale is actually harder to play than the Great Fugue; as astounding as this news was, after what I'd just heard I wasn't surprised.) Throughout Op. 130 the players were working their tails off, but never more so than in the Finale, and at no point in the concert were they more animated and alive. Martin Beaver leapt from his chair every time the music with a rush revisited in its most emphatic form the principal thematic complex, only to settle back into it as his violin lead skipped from crest to crest of that musical wave; before long his bow had frayed, fine hair-like strands whipping through the air above his head as he played. More so than ever before I recognized throughout the movement the steely influence of the absent Fugue, which hovers over the work like a guardian angel or dæmon. However shy of perfection it may have been, the performance was nevertheless utterly exhilarating, and made of me a total convert to the validity and brilliance of Beethoven's second thoughts, thoughts he never would have come to if he had not first journeyed through the Grosse Fuge to reach the alternate Finale's autumnal, valedictory shore. For indeed the final movement of Op. 130 was the very last composition Beethoven completed, preamble to several bedridden, terminal months spent reading, with growing delight, the newly published scores of Handel's complete oratorios and Mozart's complete string quintets. It may be that, too often in the Tokyo String Quartet's hands, the subtlest sense of Beethoven's masterpiece was lost. Yet what they gave us was incredibly rich, at times awe-inspiring, the failures speaking as eloquently as the successes, a performance with tales to tell about the old master nearing his final extremities, up against the limits of life yet finding within himself the limitless extent of creation itself: the paradox at the very heart of this masterwork, which must be counted amongst the most profound utterances in the history of the human race. Legend has it that Beethoven died abed during a thunderstorm, one fist raised defiantly to the heavens. In light of the Tokyo String Quartet's performance, I imagine that fist opening like a flower, palm canting up towards the darkness above, five fingers spread; and call it a benediction. Copyright © 2011, Ron Drummond.